Home > Blog > Do You Sway? After I returned from Ignite ’17 I made a little event recap presentation using Sway. Lucky for me, the Sway team was having a little competition and selected my Sway as a winner! They announced it on the Microsoft Tech Community in October and sent me a nice little gift including a sweet t-shirt, Amazon gift card, and Sway patch. In honor of the nice prize I got, I thought I would share with you a quick tutorial for Sway. So What is Sway Anyway? 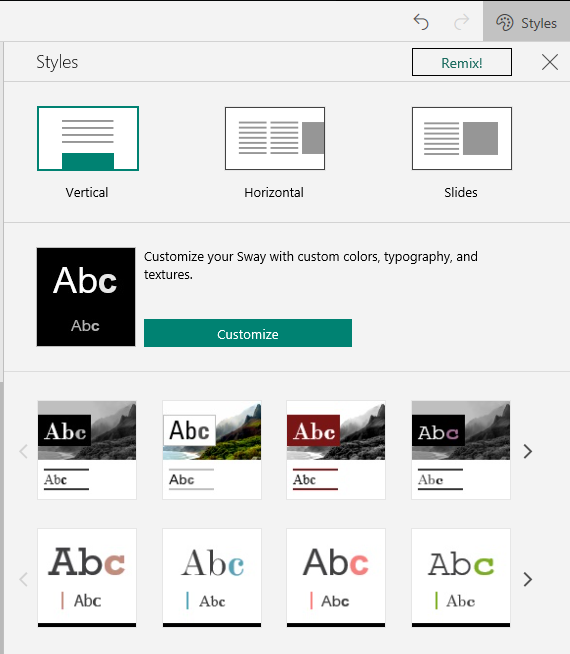 Sway is a way to create presentations that are attractive, mobile-friendly and web-ready. It was originally created for the education market and made its way to the Enterprise subscriptions and all Office 365 tenants. 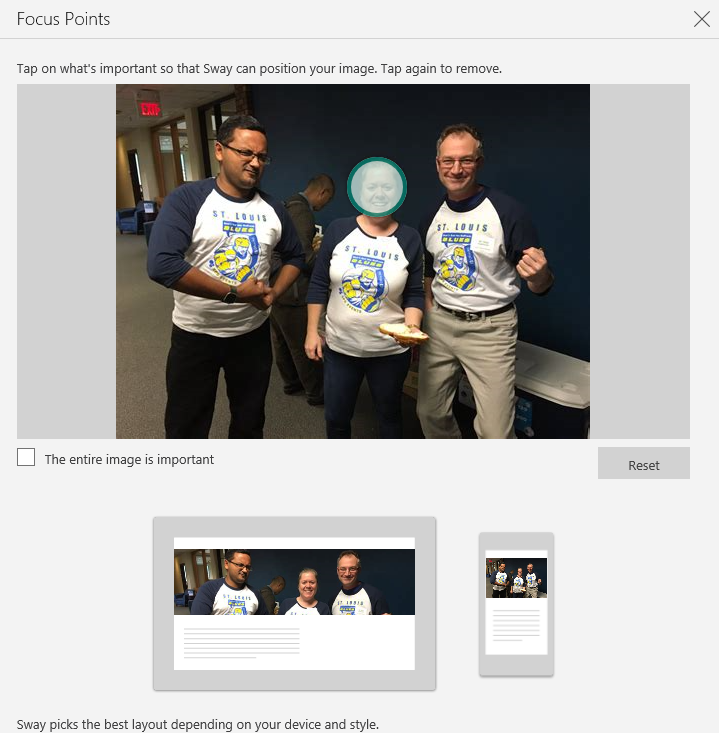 It’s an alternative to PowerPoint that is responsive, meaning it works on any sized device at any aspect ratio. There are also Sway apps for Windows, Android, and iPhone phones. You can create a Sway if you have a consumer Microsoft account or an Office 365 account. Navigate to Sway.com and log in with your Microsoft or organizational (Office 365) account. You have three options: Create new, Start from a topic, or Start from a document. For the sake of this example, let’s start with a blank slate, so select Create new. You’ll notice that you’re looking at your “storyline”. Your storyline is composed of multiple “cards” (a nod to HyperCard?) which can contain text, images, embedded videos, and more. You can choose to either embed an image, or place an image as a background behind your text. The important thing to note is that cards can display either vertically or horizontally, meaning the user will navigate either up and down or side to side to view each set of cards, and this can be modified with a simple setting. You can also use Bing to browse and select Videos to embed in your card. Select the Sway icon and click the “Add” button to add it to your Sway. Now that you have created your title card, you can start to add content. Click the plus (“+”) sign to add a new card to your storyline. Select Heading 1. Notice that your card is now inside a group that begins with the number “1”. Go ahead and type “Why Sway is Awesome” in the text portion, and select a background image as you did before. If the Bing search is still using the original search term, type the word “Awesome” into the search box to find an “Awesome” image. Select the smiley face and click the “Add” button. Now, underneath your card, click the plus sign like you did before, but ensure that the plus side is inside the gray “section” area. Add another card and select “Text” as the type to add. 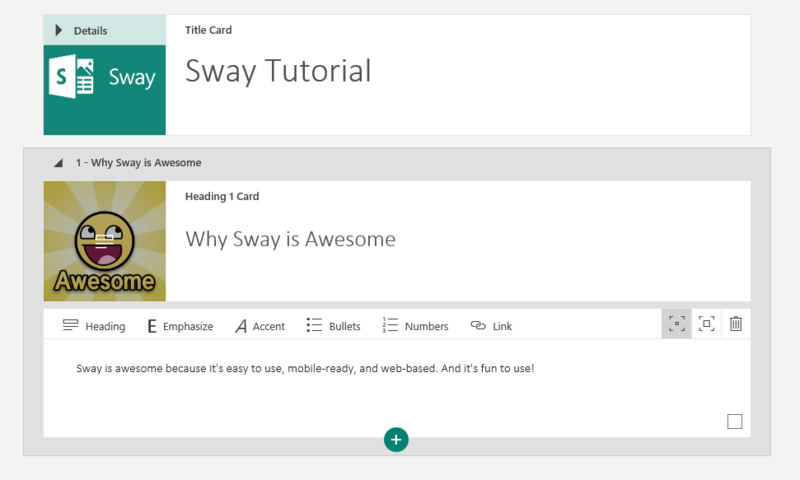 Add some text about why Sway is awesome! Now that you’ve created a bit of content, click the Play arrow at the top right of the page to see your Sway in action! Notice that at first, you will scroll vertically to see the content in your Sway. Click the pencil (“edit”) icon at the top right of the page to return to edit mode. Now click on the Design tab at the top left of the page, next to the Storyline tab. Now, click on the Styles button at the top right of the page, just below the Play button. What colors and fonts your presentation uses. Note that you can choose from pre-configured color and font options or you can customize those choice yourself (much like when choosing themes in Office documents). Once you are happy with your Sway, you can share it with others, allowing them to either view it or edit it, by clicking the Share button at the top right of the page. You can choose to Get a visual link which creates a nice summary of your presentation to embed in e-mail messages, you can choose to copy embed code to embed in another web page, or you can choose to publish your Sway to Facebook, Twitter or LinkedIn. It’s helpful to note the options available to you when you click the ellipsis (“…”) at the top right of the page. You can do things like check your presentation for accessibility, print your presentation, or export your presentation to PDF or Word. Exporting is helpful the same way you might give a PowerPoint presentation but want to distribute handouts to students; the exported version will basically reduce your presentation to card information in a graphic/text format, since the navigational concept doesn’t work with paper. So, that’s it! Go and try it for yourself. And have fun sway-ing!